The Faculty Senate discussed Trump's immigration order and the value of liberal education (Courtesy of Linda A. Cicero). In its last meeting of winter quarter, the 49th Faculty Senate briefly addressed the Trump administration’s newly revised executive order on immigration, passed a resolution in support of liberal arts education and previewed the freshman year report. Although he called President Donald Trump’s new executive order a “scaled back version” of its January predecessor, Stanford President Marc Tessier-Lavigne cited a wide range of services still available to those affected by the travel ban including counseling services, financial aid services and travel guidance. The Faculty Senate discussed Trump’s immigration order and the value of liberal education (Courtesy of Linda A. Cicero). Tessier-Lavigne added that Stanford “continues to communicate with officials at the federal level” and reiterated previously stated reasons for not adopting the “sanctuary campus” label for Stanford. Following Tessier-Lavigne’s statement, Russell Berman, chair of the Policy and Planning Board (PPB) and Walter A. Haas Professor in the Humanities, presented the PPB’s report on the status of liberal education at Stanford. A debate escalated over the definition of the word “liberal” and whether it is still generally understood to mean “willing to respect or accept behavior or opinions different from one’s own,” as the Oxford English Dictionary states. Berman pointed to better academic and professional advising as a key strategy to encourage students to explore more interests. Berman hopes that underclassmen will be encouraged to explore more academically in their earlier years at Stanford rather than feel pressured to take introductory classes for their majors. Berman said Stanford also plans to offer freshmen seminars during the summer. While the seminars will be open to everyone, their goal is to allow more athletes who are on campus during the summer to take advantage of the courses when they have greater flexibility in their schedules. 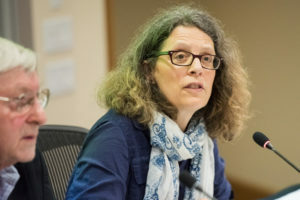 Sarah Church, senior associate vice provost for undergraduate education and professor of physics, gave an interim report on the freshman year and broke down her committee’s findings into key categories: health and wellbeing, academic choices and culture and, finally, equity and inclusion. While the full report will not be completed until the end of the year, Church provided a summary of its findings. Contact Ariel Liu at aliu15 ‘at’ stanford.edu.